Nimbuzz is a powerful, versatile, fun, and easy-to-use text and voice chat application that lets you connect to virtually every major IM service. Nimbuzz puts MobileMe, AIM, GoogleTalk, Skype, MSN, Nimbuzz’s proprietary service, and even Facebook right in your pocket, with excellent results. 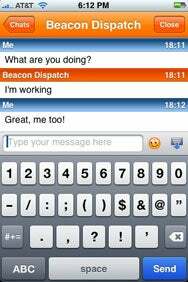 Get Buzzed: Nimbuzz is a versatile text and audio chat application for the iPhone and iPod touch, though the field for typing text messages is a little compressed. As seems to be the case with most iPhone/iPod touch apps of this type, you’ll need to create a Nimbuzz account before you’re able to use the program. Once that’s completed, you use the program’s Communities area to add all your other accounts. It took me a matter of minutes to set up my Skype, Aim, Facebook, and Google accounts. Once Nimbuzz logged me in, I was able to see all of my AIM buddies, Facebook friends, and anyone in my Skype address book. Tapping one of these contacts brings you to a secondary screen where you can press buttons to start an audio or text chat, or send a message similar to an e-mail to that specific contact. This intermediary page was a little confusing at first because it wasn’t obvious which of these features was available for the contact I had selected. After using the program for a bit, I discovered that some of the icons were disabled, but the color difference between an enabled and disabled was so insignificant that I couldn’t really tell. Text messaging using Nimbuzz is very good, working equally well across all the accounts I tried, including Facebook’s chat client. Messages sent using Nimbuzz reached their destinations instantly with no perceivable lag between me hitting the send button and the text message hitting the recipient’s screen. My only complaint about text messaging was the fact that I couldn’t see more than one line of what I was typing at a time. When you receive new messages of any sort, Nimbuzz vibrates and lets off a satisfying chirp to let you know a message has arrived, options you can change using Nimbuzz’s settings panel. Also, as long as you don’t press the home button, Nimbuzz will continue to actively receive messages, even when the screen is dimmed, locked, and your iPod is playing. I was only able to test the program’s voice capabilities using Skype and the Nimbuzz service, but what I was able to test worked great, call quality being as good as any normal Skype call. And, again, there was no noticeable lag. But I was disappointed with Nimbuzz’s dialing options. While all of my existing Skype contacts appeared in the Nimbuzz contact list, when I wanted to call someone who wasn’t in my address book I couldn’t, because Nimbuzz doesn’t have a keypad for dialing numbers directly. While this was easily resolved by adding the contact to my Skype address book, Nimbuzz would be a more complete program with the option of keypad dialing. Nimbuzz, while not perfectly polished, is a great messaging application; probably one of the best text chat applications I’ve used on the iPhone. Voice chats worked great, making Nimbuzz a very viable Skype telephone. The only missing links are minor interface issues, like more obviously disabled features and a keypad for making Skype calls. Once these issues are addressed, Nimbuzz may be a perfect iPhone messaging program. Nimbuzz is compatible with any iPhone or iPod touch running the iPhone 2.x software update.